This is one of the most important ministries at our church, know as FAITHKids. Classes are offered from nursery to elementary. We will equip your kids to live for Christ and be victorious in life all in a fun atmosphere. Learn more about the different classes below. Also, read about the measures we take for the safety and security of your children here. From birth to 18 months our caring and experienced volunteers take care of the newest additions to our church. Fun music, toys just for their age and beds (just in case a nap time is in order) are all provided in a well-maintained and clean atmosphere. From 18 months to three years old, this class starts to build on the fundamentals of classic bible stories and plenty of creative activities to help them learn. Everything from coloring, crafts and storytelling will keep your child engaged while learning about the Bible. From potty-trained to five years old, the Pre-K class is a fun group as kids start to learn Bible verses and play interactive games that challenge their knowledge all while having fun. Listening to Bible stories and hands-on activities help cement what they are learning each week. Our FAITHKids Elementary class is for kids six years old to 5th grade. Here they are able to sit down and listen to a Bible lesson from one of our knowledgeable teachers. Afterwards, there is always a fun activity to continue the lesson. 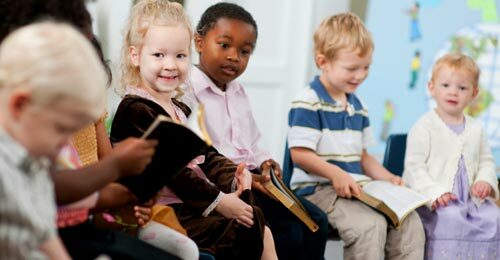 Kids are able to take home their unique creations as well as get rewarded for their achievements like memorizing Bible verses or remembering to bring their Bible to church.